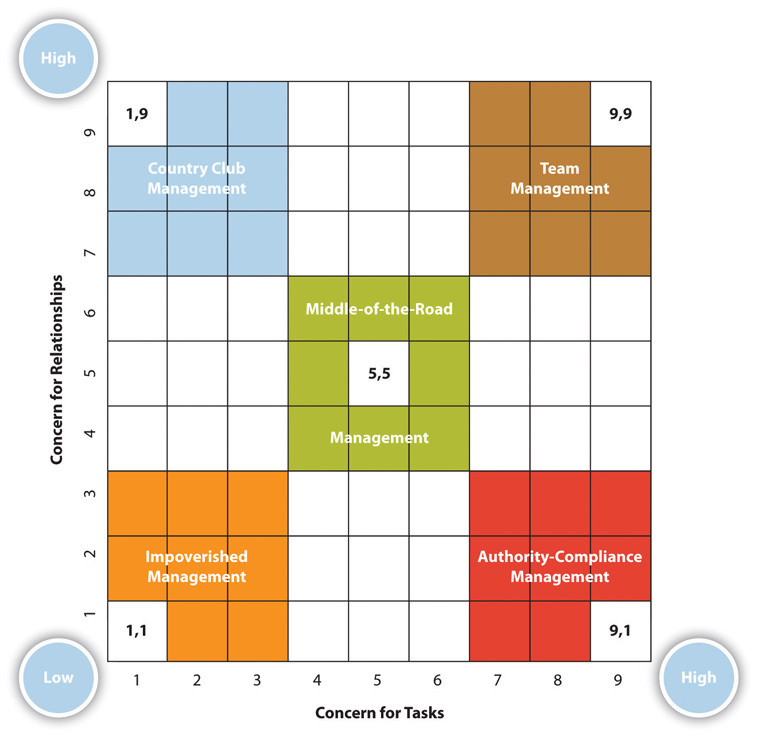 Origin of The Managerial Grid (Leadership Grid), History. Built from the work of researchers at University of Michigan and Ohio State University, while acting as advisors to Exxon, Robert Blake and Jane Mouton concluded that there are many behaviors and motivations in the middle of the X and Y extremes of Douglas McGregor. Blake and Mouton found that a management behavior model with three axes (concern for production, concern for people, motivation) was a more accurate representation of reality. Concern for People (Relationships) – This is the degree to which a leader considers the needs of team members, their interests, and areas of personal development when deciding how best to accomplish a task. Concern for Production (Tasks) – This is the degree to which a leader emphasizes concrete objectives, organizational efficiency and high productivity when deciding how best to accomplish a task. If seen from good perspective this is the type of situational leadership delegating. It would be best applied when follower or subordinates are ready, well trained, has solid team work so they can work independently allowing team to gain self-reliance. Leader able to leave the team to build another team or do another project. If seen from bad perspective it can be very harmful to project. It can happen when follower or subordinates has no experience, not mature, and not ready to engage the project. It can be told by term evade and elude or delegate and disappear management style. This happen usually when leader believe the project is not worthy, useless, or management doesn’t care with project existence which makes no control in project which likely will be abandoned. Example for bad perspective it can be illustrated. When manager asking senior engineer to coach junior engineer or intern student about working environment organization or project. Since senior engineer believe this coaching doesn’t have benefit for him, he abandon this task and do other else which he consider more important. And also the manager never ask or care about junior engineer or intern student readiness or adaptation after he delegate to senior engineer. It can happen also in nonprofit organization that based on volunteerism. This style has a high concern for people and a low concern for production. Managers using this style pay much attention to the security and comfort (needs and feelings) of the employees, in hopes that this will increase performance based on assumption that as long as team members are happy and secure then they will work hard and self motivated. The resulting atmosphere is usually friendly (very relaxed and fun), but not necessarily very productive (production suffers due to lack of direction and control). Manager is almost incapable of employing the more punitive, coercive and legitimate powers. The style is common among leaders who are afraid of upsetting people, and/or who fear rejection and being disliked. – Usually subordinates come based on volunteerism (they may go if not satisfied, followers have the option to walk away). – Manager or Leader doesn’t have “stick or carrot” authority to reward and punish. – Manager or Leader still has little experience in leading team or manager less competence knowledge about project. – Subordinates more senior than the manager. In good perspective this is the type of situational leadership directing. A directing leader is needed by followers who do lack both the skill and the motivation to perform a task. But when this type of leaderships is not followed by healthy communication these types of leaderships go into harmful way. a high concern for production, and a low concern for people. Produce or perish, controlling, direct and dominate, desired for control and mastery. Manager who implement this leadership are very much task oriented and are hard on their workers (autocratic). There is little or no allowance for cooperation or collaboration. Heavily task oriented people display these characteristics: they are very strong on schedules; they expect people to do what they are told without question or debate. The manager is intolerant of what they see as dissent (it may just be someone’s creativity), so it is difficult for their subordinates to contribute or develop. Production oriented or task oriented. Result will be high level of dissatisfaction and conflict within the group, high output is achievable in the short term (peak performance is short lived), much will be lost through an inevitable high labor turnover. – it can be effective in the short term, and interestingly, where a group is failing to react suitably to a serious crisis then it may actually be a viable style for a short period, but the approach is not sustainable. – These type leaderships will not suitable in volunteerism approach when followers have the option to walk away. – Manager has “stick and carrot” authority to give reward and punishment. – Subordinates or follower has little experience less competence knowledge about project. – Manager more senior than the subordinates. Balance and compromise. Managers using this style try to balance between company goals and workers’ needs. This style seems to be a balance of the two competing concerns. It may at first appear to be an ideal compromise. Therein lies the problem, though: When you compromise, you necessarily give away a bit of each concern so that neither production nor people needs are fully met. Leaders who use this style settle for average performance and often believe that this is the most anyone can expect. Medium Production/Medium People. The leader does not push the boundaries of achievement resulting in average performance for organization. Contribute and commit, High Production/High People. In this style, high concern is paid both to people and production. As suggested by the propositions of Theory Y, managers choosing to use this style encourage teamwork and commitment among employees. This method relies heavily on making employees feel themselves to be constructive parts of the company. According to the Blake Mouton model, this is the pinnacle of managerial style. These leaders stress production needs and the needs of the people equally highly. The premise here is that employees are involved in understanding organizational purpose and determining production needs. When employees are committed to, and have a stake in the organization’s success, their needs and production needs coincide. This creates a team environment based on trust and respect, which leads to high satisfaction and motivation and, as a result, high production. The leader feels that empowerment, commitment, trust, and respect are the key elements in creating a team atmosphere which will automatically result in high employee satisfaction and production. This style normally requires that followers/the group are suitably mature and skilled for a high level of involvement. The style is difficult to use, and may be inadvisable, when leading inexperienced people to produce challenging and vital results in a new or strange area. Exploit and manipulate. They adopt whichever management style offers the greatest personal benefit. Persuade others to support results that offer private benefit. If others also benefit, that’s even better in gaining support. Relying on whatever approach is needed to secure an advantage. Prescribe and guide. It was redefined to alternate (swings between two extremes) between the Country Club (1, 9) and Authority Compliance (9,1) locations on the grid. Managers using this style praise and support, but discourage challenges to their thinking. There is a need to control and dominate and resistance is met with punishment. At the other extreme compliance is reinforced by recognition and appreciation. Limiting others ability to contribute, provide leadership by defining initiatives for others and offer praise and appreciation for support and discourage challenges to their thinking. This entry was posted in Volunteer_Delano and tagged managerial grid. Bookmark the permalink. Keep up the good work, Pak Delano but remember, you are unlikely to see more than two or three questions on the various managerial style questions. These you will find in the “Part 1” portion of the exam which is very easy. The “tough” questions will come from “Part 2” (the narrative response) and Parts 3 and 4, which are the single case studies or scenarios with multiple questions. To prepare for those questions your best bet is to focus on the Humphrey’s Case Studies. IF you can easily do the case studies in Humphrey’s you should have no surprises in any of your AACE exams. Dr. PDG, packing up in Boston……. Dear Dr.PDG, I know this will only cover some parts in CCE/CCP Exam, but I feel called to know and even implement this knowledge, since the Ideal Cost Engineers, Project Management Professional should know and implement their knowledge for better results.